Your Reaction: What did you think of The Sleeping Beauty live in cinemas 2017? A selection of responses to Marius Petipa's enchanting ballet, with music by Tchaikovsky, broadcast live in cinemas across the world. 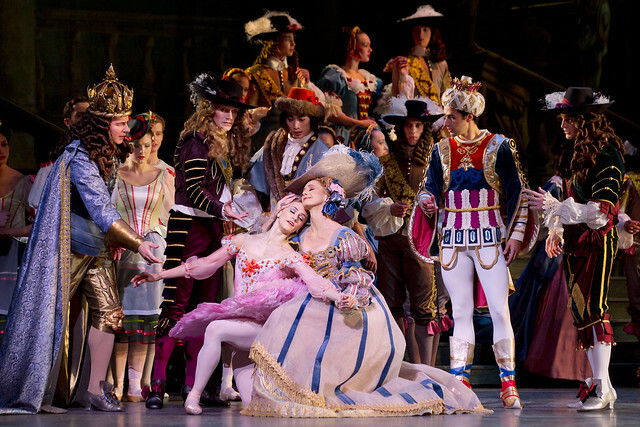 #ROHbeauty was astounding; impeccable dancing, enchanting storytelling & dreamy costumes, I didn't want it to end! Thanks @TheRoyalBallet! @TheRoyalBallet #ROHBeauty such a brilliant performance tonight. In awe! A feast for the eyes and ears. Live cinema such a great thing. What did you think of The Sleeping Beauty live in cinemas? The Sleeping Beauty runs until 14 March 2017. Tickets are sold out, but returns may become available. Further tickets are released every Friday for performances in the following week in Friday Rush. The production is staged with generous philanthropic support from Mrs Aline Foriel-Destezet, Hans and Julia Rausing, Lindsay and Sarah Tomlinson and The Royal Opera House Endowment Fund and is sponsored by Van Cleef & Arpels, with the original production (2006) made possible by The Linbury Trust, Sir Simon and Lady Robertson and Marina Hobson OBE. I saw this at the ROH over christmas with a different lead, so I had a comparison point, and I thought Marianela was amazing this evening. Rose Adage was simply stunning. I definitely want to see her live at some point, possible new favourite! Loved tonight's performance. Marianela Nunez sublime as usual, Claire Calvert a beautifully assured Lilac Fairy and Kristen McNally had a great time with Carabosse. Lucky Marianela having such a Prince - he makes it all look so easy. Also wanted to mention Anna Rose O'Sullivan, I thought she was wonderful in her fairy variation tonight. Can't get enough of this production - my 3rd viewing this season and back again on Saturday. Thank you Royal Ballet. I think it has been the most beautiful "Sleeping beauty" of my life!!!! Marianela and Vadim were absolutely superb!!! And Vadim... he is so elegant, charming, technically gorgeous!!! It has really been a wonderful evening!!! Wonderful performance this evening, watched form Showcase Cinema in North Lanarkshire Scotland. #ROHBeauty. Thank you so much to all involved. Had a truly mesmerising evening. Stunning, just stunning! Marianela and Vadim on fire tonight. The Rose Adage moved me to tears - Marianela was positively radiant - and Vadim's solos - what can I say? Every movement beautiful and brilliant. Bravo to them and all the cast. Great production. Close up shots really made a difference. Darcy and Ore conversations were an added bonus as were the interviews. Amazing synchronisation between dancers and with the music, and some pleasing symmetry in the patterns. The dance steps look very difficult but they were well performed. It was good to see Darcey Bussell in the intervals. Went to Sleeping Beauty and thought it was just magical. Beautiful dancing by all, costumes were marvellous and really enjoyed it including all the extra bits of information from the interviews. I remember Beryl Grey dancing from my youth! Such a lovely performance. Claire Calverton was a lovely Lilac Fairy - what beautiful feet she has! All the soloists danced well. Standout Yasmine Naghdi and Annarose O'Sullivan who were just delightful. It was also really great to see Gemma Pitchley-Gale in a solo role, a very expressive dancer. Vadim Muntagirov is a lovely damcer. Such elegant lines. Its impossible for him to make an ugly move. (Pity about the fish dives). However the highlight was Marianela Nunez technically sound as always but it's her interpretation and sunny disposition that is perfect in this role. What a treasure she is. In a print-out at our cinema, Hayward was listed to dance Princess Florine. Was the casting changed at some point? Marianela was wonderful as was the whole ballet. Thank you for your message. There were a few cast changes that unfortunately came too late to change on the printed cast sheets. Updates were made on the Digital Programme and the Cinema webpage. I hope this helps. Stunning performance, absolutely loved it. That must be the biggest boquet of flowers ever to grace the ROH stage, but you deserved it Marianela! Bravo beautiful ballerina. It was so lovely from start to finish. The best yet. Thank you. Having been privileged to be at the wonderful performance on Saturday night in London, we couldn't resist going to the cinema link performance last night - a totally different cast. Absolutely loved both. Amazing production. Well done ROH and congratulations to all involved. We were at the cinema link at The Island cinema in St Annes and there was no transmission problems, but we just felt that the picture we received was too dark and you couldn't see figures towards the back of the stage. The colours at times were just not as we know they should have been. A minor comment. However, too much talk in-between takes the shine off the magic. Magnificent! Loved Francesca Hayward - such poise and elegance. How the orchestra followed the conductor's wild thrashings I just don't know. Francesca Hayward was not in it in any of her roles . so, who did you really like ?? Old cast listings printed for cinemas . full AMENDED casting on the cinema website . 2 Fairy changes in prologue inc F Hayward. Also changes to Florestan &sisters. Ken, unfortunately Francesca Hayward did not dance last night. She was very ably replaced by Meaghan Grace Hinkis as 'Fairy of the Songbird' and by Akane Takada as 'Princess Florine'. These are just a few of the many cast changes from the Cast List handed out in cinemas. James Hay was replaced by Marcelino Sambe. I wonder if the dancers have been hit by a 'flu' epidemic? Sorry Ken, but Frankie was not dancing, she is ill. They mentioned cast changes at the start but didn't say who. Please do tell next time. Nela, Vadim and everyone wonderful. Do I hear DVD please? Many thanks Royal Ballet for a great evening at the cinema enjoying wonderful dancing. The highlight for me was the Bluebird pas de deux with Akana Takada and Alexander Campbell. A lovely Princess Florine. And the Bluebird literally floated across the stage, his feet seemingly never touching the ground. What a rare delight! Sorry that Francesca Hayward is unwell. Best wishes for a speedy recovery. I attended the matinee on Sat 25th February. The performance was amazing, definately the benchmark for all other companies to aspire too. The only negative was the 'rats' not that the dancers didn't perform as required, but I found the costumes ugly and distracting. The same effect could be achieved much more elegantly and still be in keeping with the story being told in this ballet. Well done all at The Royal Ballet and The Royal Opera House. Wonderful performance last night. I was hoping to see my favourite male dancer, Steven McRae, but Vadim was spectacular. Now looking forward to seein Jewels in April. I adored the performance and the presentation by Darcy and Ore was interesting, well presented and a great way to fill the intervals. However, would have prefered to have full stage view throughout as more authentic to imagining you were actually seeing a live performance. Close views of dancers made it feel more like a film or a TV production than a live perfomance. Simply stunning - couldn't take my eyes off the stage. Feeling wonderful today. So lucky to see this beautiful performance. I must press you to consider a DVD & Blu-Ray release of this performance, as a companion piece to Marianela and Vadim's Giselle. I think you are missing a trick here. I recently attended a performance sitting in the amphitheatre and whilst the view is a distant one it is perfect for any corp de ballet dancing, you can really see the formations and beautiful patterns created by the corps. It brings a whole new dimension to the performance. You should consider putting a camera up their and seeing how it works. Great show last night. You're quite right. Viewed and filmed almost exclusively from Stalls/Circle level as all ROH relays are, most formation work for the corps de ballet is effectively illegible, coming across as nothing much more than a thick, flailing forest of knees and feet in the absence of being able to read the spatial composition in depth as afforded only by an elevated viewpoint. I think perhaps the Amphi view is a tad too high: but certainly the Balcony should be co-opted for filming purposes (use the space where they normally stick the sound-mixing desk for works that use amplified electronics). The Bolshoi's DVDs actually include shots taken from overhead, with a camera stuck up in the fly-tower, to give the whole Busby Berkeley experience. I'm not for a moment suggesting the Royal should follow suit - the effect on the Russian discs is bizarre and alien to the theatrical experience - but the massed choreography is far more readable as a result, and a higher viewpoint cut into large-scale corps-de-ballet sequences would yield genuinely artistic benefits. Had a great time at the Cinema last night. Glad to see so many productions now being performed on live stream. I often glance up to the Amphitheatre where I used to sit when I lived in the suburbs. Now in Devon, it's such a bonus to see the performances live. Stunningly beautiful ballet at it’s very best. Magnificent sets; fabulous lighting; opulent costumes; stunning choreography; spellbinding music; fantastic musicianship; sublime solos; wonderful cinematography; breathtaking dancing; Beryl Grey; and Darcey Bussell – what more could you ask for. Marianela Nunez delivered the best Princess Aurora (bringer of light and hope) ever – bringing grace, elegance, beauty, strength, and stamina to one of the most challenging roles in the classical ballet repertoire – and as for Claire Calvert – this lady will go far – her interpretation of the wise and powerful ‘Lilac Fairy’ was sublime – capturing all of the right attributes: from loving, doting concern for the princess, through to trust and respect for her fairies; protection for the royal family and guidance for the prince who is to be Aurora’s saviour; to powerful emotive demonstrations of strength, power, and fortitude each and every time the need arose. Just magnificent! And ‘The Lilac fairy’ who bestows wisdom upon the princess. ASIDE: Interestingly, ‘the good fairy’ aka ‘the lilac fairy’ draws her name from ancient folklore. According to the folklore, ‘wisdom’ is bestowed upon a child placed beneath a lilac bush – and a child placed under a mulberry bush will rise to great heights. This association is likely because the red flowers of the mulberry glow at night and look like stars in the cosmos. 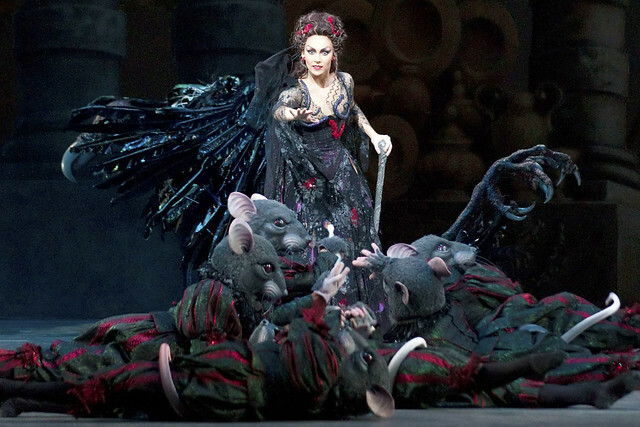 When Carabosse – with her entourage of rats - confronts the fairies who plead for her to lift the spell, Carabosse mocks these attributes – saying that they are worthless because the princess is going to die prematurely. Of course that doesn’t happen because there is always ‘Hope’. ASIDE: Liverpool boasts two cathedrals – one Catholic, and one Protestant - each a few minutes away from the other. The name of the street that connects the two is called ‘Hope street’. And now – a piece of ballet trivia. What connects Mathew Bourne’s ‘Sleeping Beauty’ and Carlos Acosta’s ‘Don Quixote’ (best version ever) to the classical musical ‘Singing in the rain’ (now available on BluRay fully restored by Martin Scorsese from the original ‘three-strip’ Technicolor camera negatives)? I shall pop back later with the answer. Happy dancing and happy Saint David’s day. Thank you so much to everyone involved in this wonderful production. Marianela and Vadim were just amazing and it was a real joy to see this. Thank you ROH for the live screenings. It was a magical night! Waiting for a DVD....This performance of Marianela and Vadim is an INSPIRATION for future generations of dancers. In Mathew Bourne’s ‘Sleeping Beauty’ the fairies – standing in arabesque - are transported into the christening scene on a conveyor belt. In ‘Singing in the rain’ Gene Kelly tap dances his way along a conveyor belt as he looks for a job in the dance number ‘Broadway Melody’. In act three of Carlos Acosta’s ‘Don Quixote’, Kitri (fabulously performed by Marianela Nunez) and Basil (beautifully played by Carlos Acosta) dance on the top of tables. In ‘Singing in the rain’ Gene Kelly and Donald O’Conner dance on top of a desk during the dance routine ‘Moses supposes his toeses are roses’. This is all linked together with the dance routine ‘Good mornin’ featuring a spectacular performance from Debbie Reynolds – who passed away recently. Totally agree with Elia Amato – last night’s performance truly is inspirational. The Cinemalive encore is on Sunday the 5th of March at 2 o clock GMT. One thing I love so much about Royal Ballet in cinema are the unparalleled close up views that I'd never be able to experience in person unless I won the lottery. Please don't ever change that about the cinema relays. The second thing I love the most are the insightful interviews and behind the scenes footages of rehearsals! These add yet another dimension to the production and have greatly enhanced my appreciation of all the performances I've seen so far. A new benchmark Aurora. Moved to tears all the while smiling from ear to ear. And a wonderful prince. Thank you,too, for sensitive camera work pulling back enough to see all that patterning by corps de ballet. Adding to call for dvd of this performance. ( just watched Marianela and Vadim in Giselle and so very grateful! Again, this Beauty will never be one dvd too many no matter how many productions one has) . Thank you. A wonderful evening at the Odeon Cinema Dorchester last night marred only by the lighting or rather lack of it. The recent screening of 'The Nutcracker' was the same. Fortunately the artistry of the dancers shone through the gloom. Thank you for letting us know. We are following up with the cinema and hopefully the picture lighting will be properly adjusted for all future screenings. I'm happy to announce that a DVD is planned for release in April 2018. Congratulations to the technical team, the quality of the video was absolutely outstanding. And of course the Royal Ballet's performance was brilliant as well, a wonderful evening! 4 of us went to see S.B. but were slightly disappointed with the production. 3 hrs was much too long to sit thro' and we also found it very repetitious all the way thro'- less of Darcy Bussel won't come amiss either. The fairy and main characters excellent but not my scene I'm afraid. Watching Sleeping Beauty last night at Guildford Odeon was an amazing and memorable experience with beautiful dancing, music, costumes. However the cinema screening was interrupted by blips in the screening, where the sound disappeared for a second or two ,the screen froze, then came back. This happened on at least 6 occasions, may be more. There was also loud clunking to be heard as well coming from the screen, The usher mentioned it to be a "streaming" issue. Have you had any other similar reports? Thank you for taking the time to write to us. I'm very pleased to know how much you enjoyed the performance despite the technical issues that you experienced. We have had this already reported to us and I can assure you that there were no streaming issues during the relay. We are already following up with the cinema and hope that it will be fixed for future screenings. Magnificent score, superb staging, costumes and finally the truly spectacular dancing, Marianela, Vadem being outstanding, without equal. I am proud to see OUR Royal Ballet, the crimson curtains with ERII in The Royal Opera House, THE BEST ballet dancers. Well done to everyone, thank you for a wonderful evening. What a wonderful evening! It completely swept me away - I loved every minute. Marianna Nunez was enchanting as Aurora. Part of her charm is exactly what Kevin O'Hare referred to - the way she managed to make it appear as though she was dancing the role for the first time. She was completely in character and her face was as expressive as the rest of her. Vadim Muntagirov was wonderfully athletic - but also brought youthfulness and vulnerability to the role of Florimund. They were stunning individually and together. I very much enjoyed their performance in Giselle - and again here. Will specially look out for them in the future. I agree with the comment about wanting to see the whole stage as though you are actually there. In fact, I thought the filming last night was very good, without too many close-ups - and those there were, were well chosen. DVD please! It's a while since the last Sleeping Beauty one (2006?). A comment about the broadcast - PLEASE stop Darcey and Ore talking at the end over the curtain calls! It happens every time and I can't be the only one who wants to see them uninterrupted and in full - I like to watch the dancers getting their much deserved applause. I know they have further announcements to make, but surely these can wait another couple of minutes? I find it rather disrespectful to the dancers as well. the most wonderful ballet on 28th February.the ticket was a birthday present from my son,and it was a perfect gift.the dancers were all excellent,the orchestra magnificent.beryl grey was enchanting.bravo.looking forward to the next performance. What a very special production! I particularly loved Princess Aurora, Marianela Nunez, and the wicked Carabosse, Kristen McNally, also The Lilac Fairy, Claire Calvert. What an amazing evening, thank you so much Royal Ballet. How fortunate we are to be able to see these performances streamed live at cinemas. I loved everything about it, besides the dancing, especially the costumes and scenery - wonderful! I was so sad to miss this will there be an encore? There are encores taking place this Sunday across the UK and a few happening a few days later. Please check our webpage here to find cinemas near you still showing The Sleeping Beauty. We watched this at a cinema in Beverley in the East Riding. It was excellent. Was at the performance and absolutely loved it. Marianela and Vadim are a dream partnership! For the DVD/Blu ray release, is there any chance that the extra material that cinema goers get to see could be included?? Ie. Darcey / Ore introductions and other interviews. Also, is there a possibility to include the insights event on the disc?? I'm one of the 88,000 people having watched the insights on YouTube, but it would be great to actually have the possibility of watching this again on disc at some point in the future. I'm new to ballet and went to see the live streaming of SB in Wrexham with my lovely partner, as she adores it. What can I say?! the dancing, sets, costumes and music were mesmerizing. Being a lifelong fan of classical music I don't know why it's taken me so long to discover ballet. Congratulations to everyone involved, it was a truly memorable performance. I'm hooked. Fabulous performance by everyone, went to see Sleeping Beauty at our lovely little theatre in Aspe, Spain. I felt as though the performers were on the stage, it was so mesmerizing. Can't stop talking about it. Well done. I note another viewer noticed the dark picture at times, especially when the whole stage was shown. Can you ask Richmond upon Thames Odeon to adjust their picture settings too please? It didn't spoil my enjoyment of the ballet, but it would be good to see it in all its complete and total glory. Thank you for letting us know. We'll follow up with the cinema in question and hopefully their future screenings of our relays will show as they are meant to be. A few points. I too noticed that the lighting was not good for the long shot pictures of the whole stage and mentioned it to my friend at the time. As a few people have mentioned this I think it must have been that the lighting was not best suited for the filming - I may be wrong. Certainly the lighting was excellent when I was at the live performance on 15th and 23rd February. Secondly; I was surprised that after Darcy told us that there were some changes we were not told who they were. Having been to the filming on 23rd I guessed that the cast on that night would be dancing and not as per the cinema programme. So far I think others have mentioned all the changes from the cinema cast sheet except for Mayar Magri who was dancing in place of Beatriz Stix-Brunell as one of Florestan's sisters. But I did feel sorry for the cinema audience being left in the dark. Finally someone has mentioned the benefit of a camera in an elevated position for the corps de ballet dances using the whole stage. I not the Bolshoi uses an elevated camera for their live streamings and it does show off the corps to its best. Just a thought for the future. After all the RB productions are so superior in every way it is a pity not to maximise that excellence for the cinema audience. As for the RB superb production I can not add to the praise heeped upon it by others, but the mere fact that I have seen each of Marianella's and Vadim's three appearance and will be at the encore on Sunday should indicate what I thought of it. Truly the standard Beauty of its time - at least as good as anything else. And you know that Marianela would achieve the same excellence if asked to dance it every night because she does not want to be anywhere else other than dancing. Gosh the RB is lucky to have here. What would other companies give to have her as part of their company. Thank you RB for such a wonderful streaming and thank you for the DVD - 14 months is a long wait well worth while. I must add; a bad ommission on my part. Vadim was sublime, just superb, as acting, his expressions just right but most of all his dancing has reached total maturity. Marianela and he are both so lucky to be able to dance together. An unbeatable team. So pleased that I will be able to add this Beauty to my DVD collection in April. I really loved this performance congratulations to a superb cast - well done all round. Loved the re-created costumes too - reminded me of when I first saw the ballet with Beryl Gray as Aurora many years ago now. Long may these screenings continue as they enable me to see live ballet - we get so few here in Manchester, never the Royal and I find theatre visiting too difficult now with sever mobility problems. So live screen is wonderful. Looking forward to Jewels next. Superb performances from both lead principals, Marianela's rose adage was beautiful while Vadim's solos were just mesmerising to watch, and to see them dance together was just sublime! Special shoutout to Akane Takada and Alexander Campbell's performance of the bluebird - it was so light and beautiful both individually and together, their timing was impeccable. Marianela and Vadim are perfect together. I love Meaghan Grace Henkis is so good I am a big fan. Enjoyed the 'encore' in the cinema today very much indeed. The filmed snippets and interviews are much improved. But, why oh why, was the applause for Muntagirov's solo curtain call softened for a voice-over from Darcey and why did we have to cut to the presenters saying goodbye from behind the curtain instead of seeing Nunez take her solo curtain call? It would be really nice to be able to sit in the cinema and enjoy the audience reception for the stars in full. Pleased to here the justified praise for the soloists from Dame Beryl Grey and Darcy. Nunez splendid and Muntagirov turning into a star. My heart fell into my shoes at the beginning when Ore Oduba appeared again, thought we were over that. But much relief that someone has had a word with him to stop calling us 'Guys'. He still needs to stop give the impression that he is not listening to answers and stop pushing people into a race for time. I am afraid he brings stress rather than relaxation. These events are not football matches. I like Ore. He brings a refreshing lack of pomposity to the occasion. It's obvious he knows little about ballet but that's fine - nor do the majority of the cinema audience, I would guess. Who needs ballet bores speaking in reverent tones? Anyway, the performance speaks for itself - the whole company from corps to principals was on top form. Long live the cinema relays, charming presenters and all - thank you! Watched the screening of Sleeping Beauty at Teignmouth this afternoon and was completely enthralled. Wonderful screening, great to be able to see fine details of the performance and costumes, The dancers are amazing; I am not a dancer but even I could appreciate the wonderful talent. Thank you ROH for the opportunity to see this memorable performance! My daughter and I really loved this performance in Holland. Marianela is so beautiful. Thank you for sharing this with used. Cast were wonderful, Darcy is always lovely, great to see Dame Beryl Grey I remember seeing her dance.... all spoilt by terrible lighting, had to peer through the gloom! not good enough for these fabulous dancers! The lighting is adapted for the cameras, and shouldn't have been that gloomy. Could you let us know which cinema you were at, and we can get in contact with them to hopefully resolve the issue. Absolutely wonderful performance. My niece and I watched enthralled at our local screening in Ystradgynlais in the Swansea Valley - a truly magnificent and magical evening. Thank you to everyone and congratulations. I attended the Encore at Islington Vue after attending a couple of performances of the run at the opera house. I wondered why the staging (except for "close" close-ups) mostly looked as if it had been filmed at dusk. This didn't reflect the reality of what I saw in the theatre. I was a bit concerned about the likely quality of the DVD, but it seems there's an alternative explanation for this "twilight". Nonetheless I thoroughly enjoyed the Encore and will buy the DVD if it captures properly what I saw at live performances. Thanks for your responses to comments so far. A wonderful production. Dancing of amazing quality, I might mention here the corps de ballet who were great. The cinema experience was very good almost as good as being in the theatre. I was so thrilled to finally see the cinema relay in the US last night. Is there anything more joyful than Marianela's smile, unless it's her ability to make incredibly difficult choreography look like a breeze? Vadim's act 3 solo was stunning, and Kristen practically makes you root for wicked Carabosse. SO much fun to be able to peek behind the scenes, too. I felt like I got to enjoy a mini backstage tour between acts.